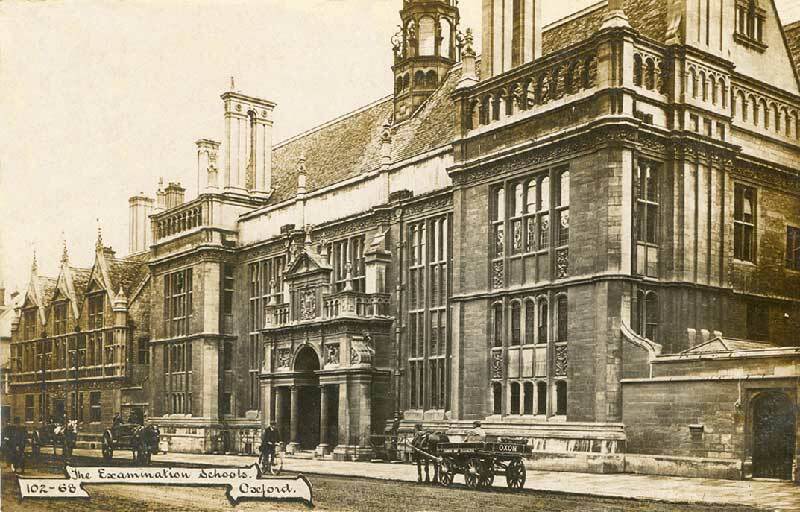 The Examination Schools (shown above on a postcard of c.1905) were completed in 1882. They are in the style of a Jacobean mansion in Clipsham stone with a Stonesfield slate roof. The architect was Thomas Graham Jackson, the builder was Albert Escourt of Gloucester, and all the carvings were done by Farmer & Brindley of London. Their total cost was £180,000. This is a Grade II listed building (List Entry No. 1115427), and the wall and doorway on the High Street to the west of the Schools is listed separately (1369366). The previous shops on the site and then the Examination Schools were in St Peter-in-the East parish until that parish was united with St Cross parish in 1957. While the main entrance hall faces the High, their three-sided quadrangle (shown below) is on Merton Street. The huge building project on the western corner of Merton Street necessitated the destruction of nine shops, of which the six listed below (Nos. 77–82) were on the site of the present Schools. As only three colleges owned the nine businesses involved, clearing this huge site was not too formidable a task, and businesses moved out as their leases expired. In addition Nos. 79–82 formed part of the ground-floor frontage of the Angel Hotel, and were bought en bloc by the University when the hotel closed in 1865. Demolition started in 1876. There is a full description of the new building in Jackson's Oxford Journal of 15 October 1881. 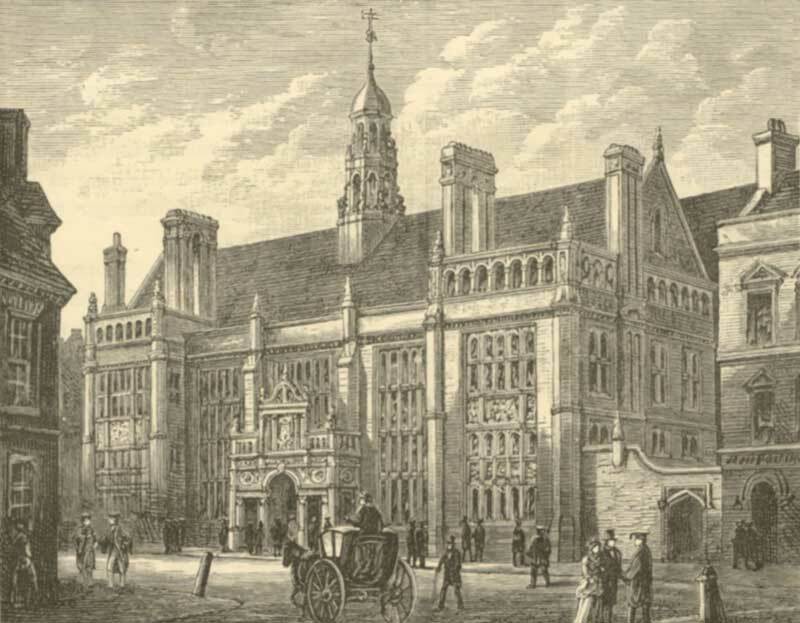 The engraving below dates from c.1882 and shows the “New Schools” before the adjoining building to the east (now the Ruskin School of Drawing & Fine Art) was built. The Examination Schools, situated at the eastern end of the High street, stand in part on the site so long occupied by the well-known Angel hotel; the buildings, as now completed, form three sides of a square, open towards the east. The style adopted by the architect, T. Graham Jackson esq. M.A. late fellow of Wadham College, is a species of Italianised Gothic, the general character of which is at once elegant and picturesque, and exhibits considerable originality of design. The principal front is on the north side, facing the High street, and has in the centre an elaborately carved porch, supported on Ionic pillars and adorned above with carvings in low relief of “the vivâ voce Examination” and “the Conferment of degrees”: at either end of the façade is a slightly projecting bay, with a spacious mullioned window and an arcaded parapet, and from the roof ridge rises a tall and elaborately designed louvre. The great north hall, entered immediately from the High street and intended as a waiting hall, is 79 feet in length by 26 wide; it is finely panelled all round in oak, and has a double coved oak ceiling with tie beam roof; on its south side three deep arches on highly enriched corbels admit to the corridor and support a panelled gallery, extending along the whole of that side, and connected by an open arcade at the end with the rooms on the first floor. On the ground floor are the vivâ voce rooms, nine in number, connected by a continuous corridor, which expands at the north-west and south-west angles into large vestibules, with flat timbered roofs, supported on pillars composed of various rare marbles, the shafts of those in the vestibule at the south-west consisting of two perfect blocks of the famous Cippolini marble, believed to be the only specimens in the kingdom, and for which the ancient quarry was specially opened. 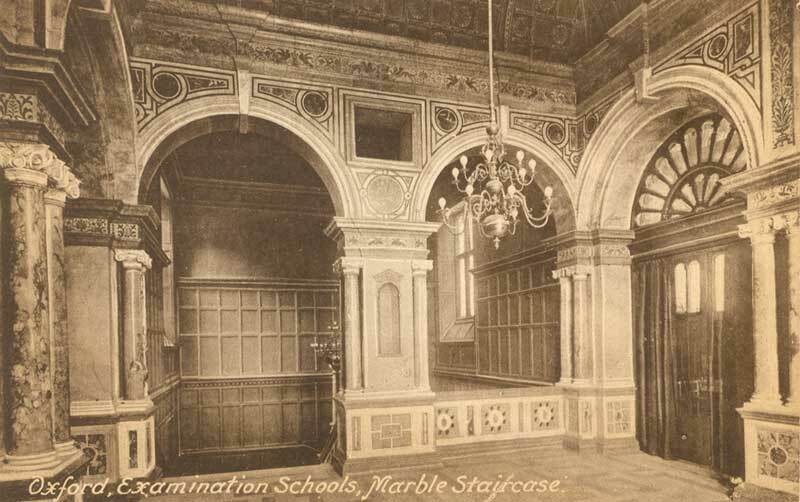 On the first floor are the north, south and east writing schools; and at the north-east angle are two other rooms, a luncheon room for examiners, and various offices: this floor is gained from below by a broad staircase of two flights on the west side, with a massive balustrading of red marble, inclosing foliaged panels in alabaster and various coloured marbles, and leading immediately to the principal ante-room, partly supported by an arcading of alabaster and inlaid marbles carried on coupled columns: the north and south doorways lead to the writing schools above mentioned, magnificent apartments, wainscoted with panelled oak and lighted by wide and lofty recessed windows, themselves surrounded and surmounted by panelled oak carving; the roofs are coved in ribbed panels, filled with rich designs in stucco, and are held together with tie beams; each doorway is inclosed in panelled oak, with carvings of elaborate character, and is curtained with heavy tapestry; the length of the northern school is 190 feet, of the southern school 110 feet, and of the eastern school 93 feet, with a general width of 34 feet. The interior elevation, facing the quadrangle, is relieved on its western side by a projecting bay of three stages, each flanked by twin fluted columns of different orders; the two lower stages on either side, supporting entablatures, inclose spacious windows; the third stage rising above the roof includes a clock with dial and is finished with a semi-circular tympanum and parapet, highly enriched; under each of the windows on this and the other sides of the interior front are carved in sunken panels the arms of the different colleges, with figure supporters. The clocks throughout the building – of which there are twenty – are all electrical, and in every room there are electric bells communicating with a common indicator in the hall, by which the officials may without trouble learn in what direction their services are required. The caretaker at the time of the 1891 census was William Wells, who lived on the premises with his wife and baby grandchild, plus their servant girl. In 1911 Frederick Pilgrim (55) was the porter who lived here with his wife. 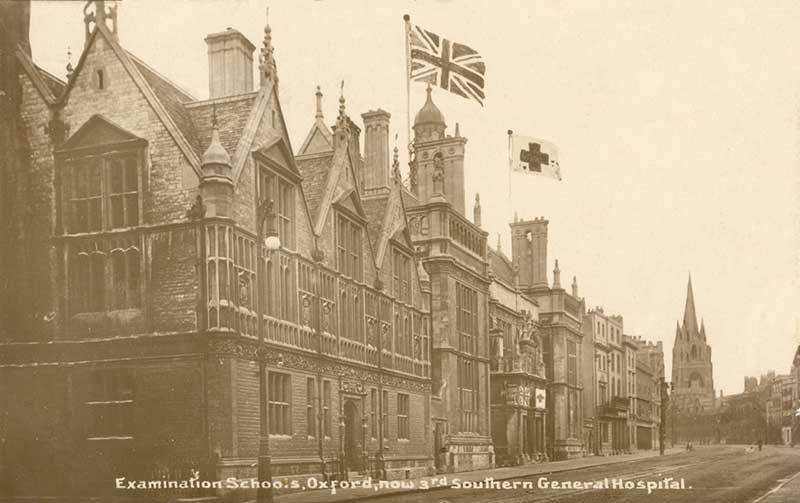 The picture below shows the Schools during the First World War, when they were used as the 3rd Southern General military hospital. (plus Nos. 83 and 84) with the ground-floor entrance at No. 84. * On 25 May 1844 Edward Hicks (Silk, Cotton, and Woollen Dyer, Furniture Cleaner, Glazer &c”) announced in Jackson’s Oxford Journal that he had moved from 15 Ship Street to “larger and more convenient premises” here at 77 High Street.